“Kahane was right. Jews, come inherit the Land.” I guess what strikes me as the sad thing is just how easy and relaxed the three of them look together. Nothing says “intellectual honesty” like publishing a photograph with zero context. If you know the actual context please tell me why the Minister of Culture let herself get photographed with 2 Kahanists. I didn’t say I knew the context, but it’s not too hard to think of what it could be. First of all, I don’t see why the slogan “Jews, come inherit the Land” is necessarily Kahanist, but that’s besides the point. Why do people have their pictures taken? For all I know these guys are cousins or nephews of hers who came dressed like that to some family event. I did a Google image search on it and all I got were a few Facebook pages, all of which used the picture to discredit Regev but gave no context for the photo. I also did a Google search in Hebrew for the terms “Miri Regev” and “Kahane” and came up with nothing,. Considering how viciously she has been attacked by the israeli left, I’m pretty sure if their was any hint of a Kahanist skeleton in her closet, it would have shown up. In English you can find a little bit of political rhetoric “She’s just like Kahane!” without any suggestion of her having any real connection with his movement. I did come across a couple of articles by left activists who mentioned her important contributions to social legislation and who suggested that one reason why she has attracted so much negative attention is that she is not Ashkenazi and the culture elite finds it difficult to deal with the idea of someone of Moroccan descent being in charge of the ministry. Sure you can say all that, but it doesn’t change the fact that she’s an important political figure who is a now pretty much a flag bearer for the political right and the ruling coalitional party. This has nothing to do with “someone of Moroccan descent being in charge of the ministry.” David Levy back in the 1980s passed that bar, and since then any number of high ranking politicians and army brass. No, it’s all about Regev, her politics, her political ambitions, the pall she’s casting over critical, yes critical, artistic expression, the violation of democratic norms, and, in this picture, the company she keeps. I am trying hard to be charitable and believe you were being ironic. 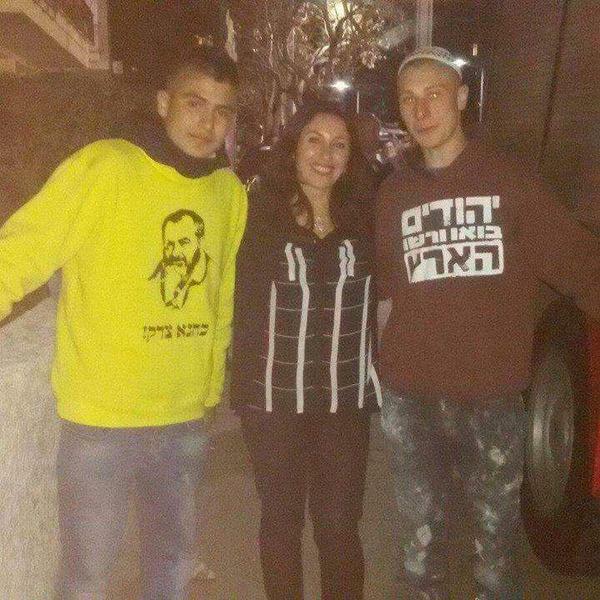 “The company she keeps” So you feel comfortable with the idea that one uncontextualized photo of her standing with some guy in a Kahane t-shirt tells you all about “the company she keeps” even while Google in Hebrew and English shows no evidence of her having any connection with Kahanist activites. Fine. Not much left to talk about. Hey, Ze’ev. Leave off DMF. I think you meant the other author of the other comment. Oh yeah, “DMF”. I’m sure that’s the term Weber used when critiquing Stammler. Looks like I’ve fallen upon a bunch real intellectuals. Seriously, dude. DMF is just an online tag. Here’s, you’re welcome to stay or to fall out. But you can’t insult. A little derekh eretz, please. OK, I didn’t realize you’ve got a friend who calls himself “DMF” – an acronym that invites confusion. I’m used to the old-fashioned practice of simply using my real name. In any event, may all your “trolls” go to the trouble I did to substantiate my point.